Vastu Shastra is a Vedic system of holistic design. It is also known as the ancient Indian Feng Shui or the art of Vedic placement. It is an ancient form of art and science that recognizes Nature's forces and guides architecture and planning, it is based on vedic mathematics, sacred geometry, cosmological and geographical physics, astrology, ayur-veda, and metaphysics, it is also applied in sacred architecture, many temples throughout India were built according to vastu. It is an advanced science dealing with construction technology and techniques for the purpose of designing ecologically sensitive or environmentally friendly building spaces, which are in harmony with subtle nature, cosmological forces and the universe. Vastu (to dwell or to exist) Shastra (science), it is also known in short as Vastu, covers the forces like electro-magnetism, gravitation, geo-magnetic energy flux, solar energy flux, cosmic waves and radiation particles which are well defined in modern physics. Vastu Shastra goes beyond the mathematical and physical description of these forces and analyses the nature of these forces in terms of their micro effects on plant, animal life and on human life in particular. 'Maya Danava' the great architect of ancient Vedic India was one of the original authors of this vast and complex mathematical science that dates back to prehistoric times, between 15,000 B.C. and 5,000 B.C. His name appears in several well-known and popular Vedic literatures like 'Ramayana' and 'Mahabharata'. 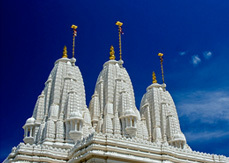 Since prehistoric times, Vedic architecture has fulfilled basic human needs along with artistic expressionism. As a result, civilizations of ancient India had the golden opportunity to create architectural designs of excessive size and elaborate magnificence as a medium of classic display. Some of the latest scientific theories enable us to comprehend the ancient formulae on which Vedic architecture is based. It is proven by modern science that everything in our universe vibrates with a particular frequency. All things we come across with or encounter in our lifetime are basically attuned to different levels of energetic vibration, which naturally interact with our personal energetic field in a certain way, either in a supportive or harmful way. As Einstein clearly explained in his fundamental mathematical formulas, everything in existence, sentient and non-sentient is ultimately a field of energetic forces. His famous equation 'E=MC2' which basically means that 'everything is energy', has enabled him to develop the techniques and sophisticated equipments that reveal subtle energy imbalances and their corresponding balancing forces. The buildings that we occupy or inhabit are simply a part of a much larger environment that can have a profound influence on us and also on how we operate within these man-made structures. Human beings function at best when they are in the same range of vibration as Mother Earth, which has the frequency between 7.8 - 12 Hertz. The main aim of Vastu Shastra application is to create building spaces to live in harmony with Nature. Our inner space and the outer space in the cosmic environment start vibrating at a particular frequency or rhythm. In Vastu, the house or the structure should vibrate and echo the sacred geometry of the cosmic universe, thus enabling it to harness the optimum benefits that we constantly seek and need in the form of spiritual strength and vital force. Therefore, we can easily conclude that Vastu is a spiritual architecture in its purest form. It is like yoga-therapy for houses.